I used to have what is commonly known as "lucid dreams." I feel that I wake up inside my dream and, all of the sudden, I am fully aware that what I am seeing is not real. Except for one time that I hesitated as I was about to jump from a building (because 99% of the time I can fly). At the last minute, I decided not to jump because the dream was so real that I was not sure if I was dreaming or not. I consider my lucid dreams to be a fun and unique experience, as most of the time I wake up inside my dream while flying. I see the planet in a very different way and I find it fascinating. But there's a stage in my sleeping process that I have experienced from time to time that is very unpleasant. The medical literature refers to it as "Sleep Paralysis." One day, as I was falling asleep, I started feeling a strong pressure all over my body. I could also hear a very loud buzz and all of the sudden I couldn't move. I felt that I was still awake with my eyes opened and I was able to look around my bedroom, but the inability to move deeply scared me. My immediate reaction was trying to wake up and I struggled for what felt to be a couple of minutes until I was able to recover from that state. During REM sleep -- the period when rapid eye movement takes place the body essentially turns itself off and disconnects from the brain. This is a safety measure, so that people do not physically act out their dreams, and it means that people are effectively paralyzed during part of their sleep. Even automatic reflexes, like kicking when the knee is tapped, do not work during REM sleep. Sleep paralysis seems to occur when the body is in REM sleep and so is paralyzed and disconnected from the brain, while the brain has emerged from sleep and is either awake or semi-awake. Usually after a minute or two the spell is broken and the person is able to move again, as the brain and body re-establish their connection. 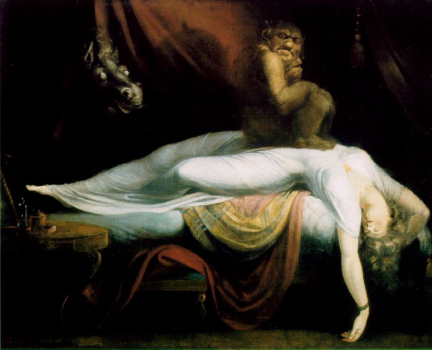 Since ancient times, sleep paralysis has been interpreted in various and different ways. From an old witch, to demons, to ghosts, to a goblin sitting in the chest of a paralyzed sleeper, all descriptions seem to obey the same set of symptoms with different hallucinations. After having my dose of Sleep Paralysis experiences, my feelings of terror sort of diminished. But one day, as I was falling asleep, I started to feel that I was floating out of my body. I tried to grab the sheets on my bed in an attempt to stop this and felt my right hand moving downwards. I struggled and, after what felt like a couple of minutes, I woke up. The flying feeling with the sleep paralysis continued. For some reason, I was always very scared to let myself go. But every time I felt like going out of my body, it always started with my feet. Even if I continuously struggled to stop this, at one point I felt I hit the ceiling. Another interesting point is that, during sleep paralysis, I always felt that I had my eyes opened and that I could see my bedroom. However, my bedroom always looked somehow different (sometimes I saw something like a hole -black in color- in the ceiling) making me realized that I was probably with my eyes closed. I consider myself a very open minded individual and always like to learn about all things (I love science!) especially those that I might personally and erroneously categorize as possible paranormal experiences. So, the two paragraphs that I posted above, explaining the sleep paralysis state, provide a very logical explanation to something that was considered to be a mystery for a long time. But I have to admit that something still bothers me. Most sleep paralysis definitions, not only include the standard paralysis, feeling of terror and thinking than you have your eyes opened. Most definitions also include: seeing someone in the room with you, feeling or listening to other inexistent people talk, out of body experiences and the last one: alien abductions. I welcome everything that the medical literature explains in a cause and effect sequence. But if scientists don't know the exact reasons of why or what can be causing all of the other anomalous events, why do they have to include them and force them to fit in the only thing that they know? I recently found an old article on The NY Times website. The title is: "Alien Abduction? Science calls it sleep paralysis"
Going as far as saying that "all" cases of alien abductions are considered sleep paralysis sounds quite arrogant to me, to say the least! I understand that a lot of the cases of people that think they have been abducted by aliens can be explained, but that doesn't mean that all of them do. Most of the cases that I have read on alien abductions have nothing to do with paralysis and going to sleep. In my personal experience, I never thought I was being abducted during sleep paralysis and I know that the same applies to most people. All hard-core skeptics (a lot of them scientists) have their minds already made up and for some reason they have a very special feeling of hate towards any person that claims to have had a UFO sighting or paranormal experience. They don't bother doing any type of investigation, they just discredit because they feel their PhDs give them the authority to do so. So far, I've only met one skeptic that I like (he is Mexican) and what I like about him is that when debating the point he has the evidence at hand to refute it. Meaning, he took the time to go out in the field to make an investigation. And HERE is an excellent article by Budd Hopkins in answer to Susan Clancy's book. Aside from the abduction cases, I am glad there is an explanation to the sleep paralysis experience. However, a lot of pieces are still unsolved by science and generalizing by trying to make it all fit in the same box will not help much to answer many of the questions that still remain.